Born at Brownwood, Texas, September 2, 1911. He graduated from high school at Weslaco, Texas, and attended Southwestern University, Georgetown, Texas, and Huntingdon College, Montgomery, Alabama. He enlisted as an Aviation Cadet October 10, 1934, trained at Kelly Field and was assigned to the 19th Bomb Group at Mar Field, California. He was promoted to First Lieutenant in October 1941 and Captain in May 1942, on assignment to Hondo, Texas, where he was Commanding Officer of a group in the navigation school. He was promoted to Major June 1942 and Lieutenant Colonel the following January, when he became Director of Training at Hondo. In June 1944, he was promoted to Colonel, having become Air Inspector, and that September moved to Brooks Field as Base Commander. He went to Guam in March 1945 in an Operations assignment for the Air Transport Command. After the war he attended the Air Command and Staff School at Maxwell Field, Alabama, and remained 3 years as an instructor. In September 1950, he went to Japan in troop carrier and combat cargo assignments during Korean War, eventually commanding the 6127th Air Transport Group and the 315th Air Div. He returned to the U.S. in April 1953 as Special Assistant to the Commanding General of the Tactical Air Command's 18th Air Force at Donaldson Air Frorce Base, South Carolina. He Moved up to Deputy Chief of Staff two months later. In September 1954 he took command of TAC's 463rd Troop Carrier Wing at Ardmore, Oklahoma, and the next month was promoted to Brigadier General. He went into Headquarters, TAC, in August 1957 as Director of Operations and Training. He was promoted to Major General in November 1958, then became Deputy for Operations of TAC in January 1960 and that June went to Headquarters, United States Air Force as Assistant Deputy Chief of Staff for Plans and Programs. In August 1962 moved to Personnel with the same title. On January 1, 1964. He was promoted to Lieutenant General and assigned to Ankara, Turkey as U.S. Representative to the Central Treaty Organization. 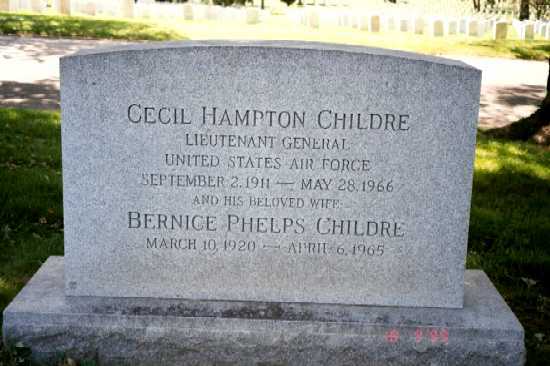 He died on May 28, 1966 and was buried with full military honors in Section 11 of Arlington National Cemetery. 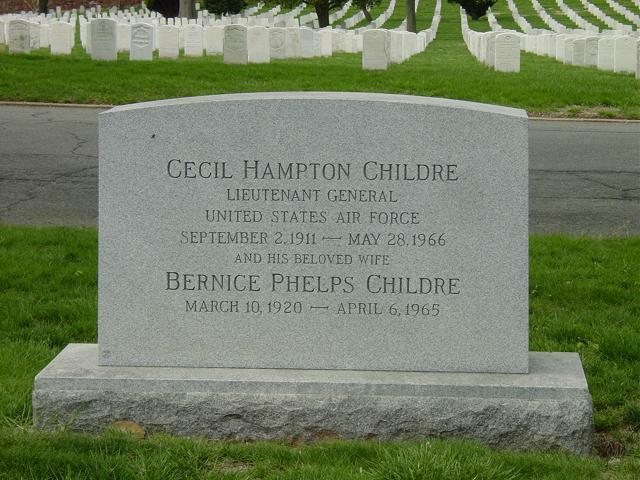 His wife, Bernice Phelps Childre (March 10, 1920-April 6, 1965) is buried with him. Lieutenant General Cecil Hampton Childre is commander of the Continental Air Command which is responsible for guiding and training thousands of Air Force Reserve personnel each year. General Childre was born at Brownwood, Texas, in 1911, attended local schools, Southwestern University at Georgetown, Texas, and Huntingdon College, Montgomery, Ala. He was appointed to Aviation Cadet Training in October 1935 and graduated from Flying Training School a year later at Kelly Field, Texas. He was then assigned to the 19th Bomb Group at March Field, Calif., and in June 1941, he returned to Kelly Field as a senior flying instructor. In January 1943, General Childre moved to Hondo Army Air Field, Texas, as director of training for the Navigation Group and Senior Project Officer at the Navigation School there. A year later, he was named director of training for the 2523rd Army Air Force Bomber Unit at Hondo and, before leaving the base in August 1944, also held positions as deputy for operations and training and also station air inspector. From August 1944 until January 1945, General Childre was commanding officer of Brooks Field, Texas. Then he became deputy chief of staff for the Pacific Division, Air Transport Command. Returning to the United States in August 1946, he became a student at the Air Command and Staff School, Maxwell Air Force Base, Alabama, graduating in June 1947. Remaining at Maxwell, General Childre was assigned as staff officer in the organization division, and later, as an instructor in the Military Management Division of AC&SS. Still at the school, in March 1948 he was named chief of the command section in the Military Management Division. He stayed in this position until November 1949 when he became director of Student Group B on the AC&SS Instructor's Staff. Reassigned overseas in September 1950, General Childre assumed duties as deputy commander of the 374th Troop Carrier Wing for the Fifth Air Force in Japan. He moved to Far East Air Forces Headquarters in Korea and established the Air Terminal units of the Combat Cargo Command. In February 1951, he moved to the 315th Air Division under FEAF as vice commander. Then, in February 1953, the general was assigned to Donaldson Air Force Base, South Carolina, and in May, the same year, he became deputy chief of staff for operations in the Eighteenth Air Force. In August 1954, he became commander of the 463rd Troop Carrier Wing of the Eighteenth Air Force at Ardmore Air Force Base, Oklahoma, and in August 1957, was named director of operations and training for Headquarters Tactical Air Command at Langley Air Force Base, Virginia. In January 1960 he was assigned as deputy for operations in the same headquarters, a position he held until moving to Washington, D.C., in June 1960. At that time, General Childre became assistant deputy chief of staff for plans and programs at Headquarters U.S. Air Force in Washington. In August 1962, he was named assistant deputy chief of staff for personnel at Headquarters U.S. Air Force. This tour of duty was followed by another overseas assignment. In January 1964, General Childre became the U.S. Representative to the CENTO Permanent Military Deputies Group in Ankara, Turkey. He stayed in the job until August 1965 when he returned to the United States for his present assignment as commander of the Continental Air Command at Robins Air Force Base, Georgia. Military decorations awarded General Childre include the Legion of Merit with three oak leaf clusters, the Distinguished Flying Cross, the Bronze Star Medal with oak leaf cluster, the Air Medal with oak leaf cluster, and the U.S. Army Commendation Medal with two oak leaf clusters. 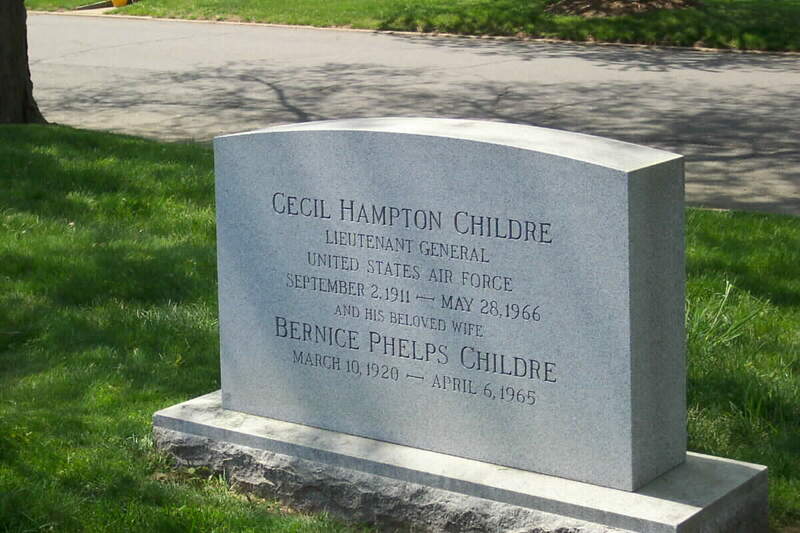 WASHINGTON, May 28, 1966 – Lieutenant General Cecil H. Childre, Commanding General of the Continental Air Command, died today of cancer at Andrews Air Force Base Hospital in suburban Maryland. He was 54 years old. General Childre, a native of Brownwood, Texas, began his service career in 1935, when he entered flight training at Kelly Field, Texas. Before and during World War II he served mostly in training duties. In January 1945, after serving as commanding officer of Brooks Field, Texas, he was named deputy chief of staff for the Pacific Division of the Air Transport Command. During the Korean War General Childre was Deputy Commander of the 374th Troop Carrier Wing for the Fifth Air Force in Japan, and later established air terminal units of the combat cargo command in Korea. In August 1965 he was named commander of the Continental Air Command with headquarters at Robins Air Force Base, Georgia. He held the Legion of Merit with three oak leaf clusters, the Distinguished Flying Cross, the Bronze Star with one oak leaf cluster and the Air Medal. Survivors include a daughter, Mrs. Charles E. Rudiger of Santa Clara, California, and a son. Army Lieutenant Burnley H. Childre of Fort Belvoir, Virginia. General Childre’s wife died last year. Funeral services will be Thursday at the chapel in Fort Myer, with burial to follow in Arlington National Cemetery.